It appears the prayers of Resident Evil 2 fans wanting a remake may have been answered. Or are at least in the process of being answered. Yoshiaki Hirabayashi, known as “H” on the official Facebook page, said he recently presented his concept for a remake. After development on Resident Evil HD Remaster finished, Hirabayashi said he started putting together ideas for a RE2 project. 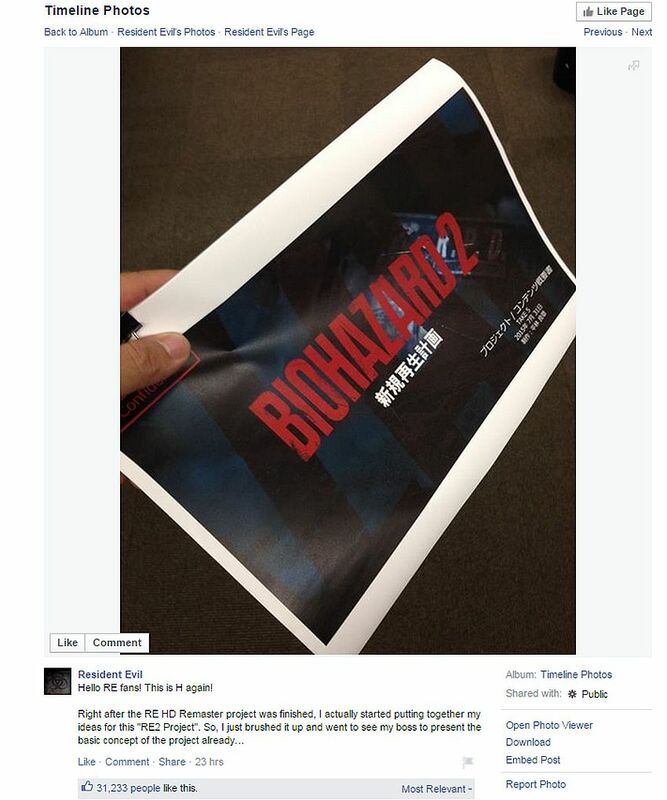 He posted an image of his presentation paperwork titled Biohazard 2: New Rebirth Project. It’s below. Hirabayashi has worked as a producer on various Resident Evil titles and as a programmer on Resident Evil 2. Earlier this week, Capcom took to the official Resident Evil Facebook page to ask fans their “honest and frank opinion” on the Unreal Engine 4 fan project, Resident Evil 2 Remake, and if they would like to see a remaster for a full on remake of the title. Hopefully, we’ll know soon whether to expect a Resident Evil 2 revamp or HD upgrade, and it’s all thanks to a vocal and dedicated fanbase.